(1) In a large saute pan, melt butter. (2) Add onion and garlic and saute for 5 minutes. (3) Add mushrooms to pan and cook for another 2 minutes. (4) Remove ingredients to a bowl and return pan to heat, stirring in cream. Gently boil cream. (5) Return mushroom mixture to pan. Add salt and pepper to taste. (6) Stir in grated cheese. (7) Add cooked pasta to sauce and toss quickly. Serve immediately. (1) Preheat oven to 200°C. (2) Line baking sheet with tin foil and lay the fillet on it, skin side down. (3) Evenly space sliced lime on top of the fillet and add salt and pepper. (4) Wrap the tin foil loosely over the salmon, making sure the edges are securely folded together so that no steam can escape. Place it in the oven. (5) Cook for 30 - 40 minutes depending on the fillet thickness. (+) The pasta tasted great! For those on diet but still dying for some cream pasta, go easy on the cheese and low-fat cream. (-) I was too greedy and used additional lime slices to line the bottom-side of the salmon fillet. As a result, the salmon was not only sour but also had a tinge of bitter after-taste. Yucks! (-) I might have cooked the salmon for too long as it tasted a little dry, So do your best in trying to estimate the baking time in relation to the fillet thickness. You might be able to get useful references off the internet! 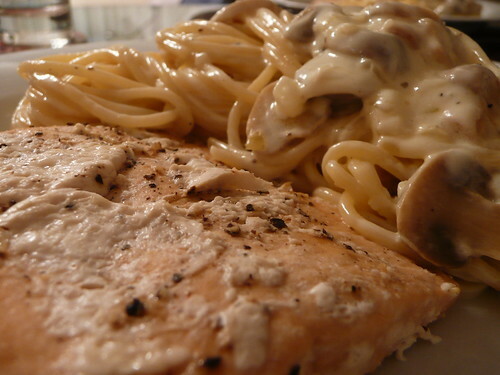 (=) I managed to clean up the pasta-half of the plate but only half of the salmon fillet. If not for the cream sauce, I'm afraid most of the fillet would have ended up in the rubbish bin.